Shri Moreshwar Ganpati temple or Shri Mayureshwar Ganpati temple is a Hindu temple dedicated to Lord Ganesha (Son of Lord Shiva and parvati). It is located in Morgaon (Village of Peacocks) in Pune District, about 66.3 km (1 Hr 53 Min) via Jejuri-Morgaon-Baramati Road and Saswad - Bopdev - Pune Road. Away from Pune city in the Indian state of Maharashtra. The temple is the starting and ending point of a pilgrimage of eight revered Ganesha temples called Ashtavinayak Yatra/Tour. 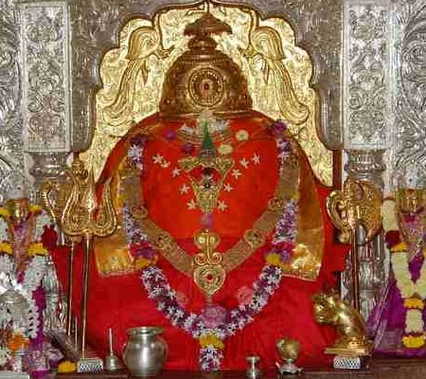 The temple is one of the Ashtavinayaka, the eight revered shrines of Ganesha in the Indian state of Maharashtra. The eleven (11) stair cases of temple have importance also the 'Nandi' in front of temple. Lord Ganesha rode a peacock (In Sanskrit, a Mayura, in Marathi – Mora), he is known as Mayureshwar or Moreshwar - Lord of the peacock. Another legend says that this place was populated by peacocks giving the village its Marathi name, Morgaon (Village of peacocks), and its presiding deity the name Moreshwar. The Morgaon Mayureshwar temple is the starting point of the pilgrimage of eight revered temples of Ganesha (Ashtavinayaka), around Pune city. The Ganesha temples tour is known as Ashtavinayak (Eight-Ganeshas). The pilgrimage is considered incomplete if the pilgrim does not visit the Morgaon Mayureshwar temple at the end of the pilgrimage. The Morgaon Mayureshwar temple is not only the most important temple in the Ashtavinayak tour, but also is described as India's foremost Ganesha pilgrimage. The temple flourished due to the patronage of the Peshwa rulers and descendants of Moraya Gosavi(Moroba). On 'Ganesh Jayanti'(Magha) and Ganesh Chaturthi(Bhadrapada) devotees flock to the Mayureshwar temple in large numbers. On both events, a procession of pilgrims arrives from Mangal Murti temple, Chinchwad (established by Morya Gosavi-(Moroba)) with the palkhi (palanquin) of Lord Ganesha. The 'Ganesha Chaturthi' events last for more than a month, until Ashwin Shukla ((10th lunar day in the bright fortnight of the Hindu month Ashwin). Fairs and celebrations also occur on 'Vijayadashami', 'Shukla Chaturthi' (the 4th lunar day in the bright fortnight of a Hindu Month), Krishna Chaturthi (the 4th lunar day in the dark fortnight of a Hindu month) and 'Somvati Amavasya' (a new moon night coinciding with a Monday). As per the Ganesha Purana, Lord Ganesha incarnated as Mayureshwar or Mayureshwara, who has six arms and a white complexion. His mount is a peacock(मोर). He was born to Lord Shiva and Parvati in the Treta yuga - त्रेता युग(Treta Yuga is the second out of the four yugas), for the purpose of killing the demon King Sindhu. Morgaon is the adhya pitha – foremost centre of worship of the Ganapatya sect, which considers Ganesha as the Supreme Being. 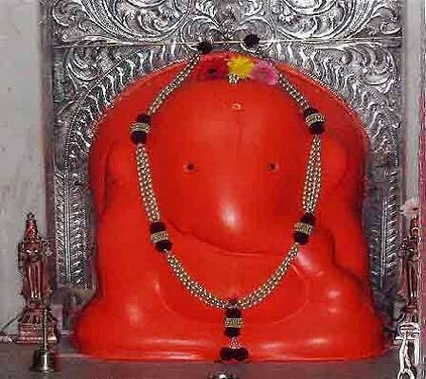 It attracts the greatest number of pilgrims in the Ashtavinayak tour/yatra. Both the primary scriptures of the Ganapatya sect praise Morgaon. While Mudgala Purana dedicates 22 chapters to Morgaon's greatness, Ganesha Purana states that Morgaon (Mayureshwar) is among the three most important places for Ganesha and the only one on earth. Located in Baramati taluka in Pune district, the place is well connected by good roads. There are frequent state transport service buses that ply from Pune to Baramati. The distance between Pune and Baramati is 64 kms. Jejuri (15 km) is the nearest railway station. The nearest airport is the Pune airport. Morgaon to Lenyadri Distance: 3 hr 30 min (143 km) via Shirur - Satara Road Fastest route, the usual traffic. Morgaon to Ozar Distance: 3 hr 20 min (135 km) via Shirur - Satara Road, Fastest route, the usual traffic. Morgaon to Theur Distance: 1 hr 13 min (62.4 km) via NH65, Fastest route, the usual traffic, This route has tolls. Morgaon to Ranjangaon Distance: 1 hr 31 min (70.3 km) via Shirur - Satara Road, Fastest route, the usual traffic. Morgaon to Siddhatek: 1 hr 33 min (65.6 km) via MH SH 67, Fastest route, the usual traffic. Morgaon to Pali Distance: 3 hr 57 min (189 km) via Bengaluru - Mumbai Highway/Mumbai - Pune Highway/Mumbai - Pune Expressway Fastest route, the usual traffic This route has tolls. Morgaon to Mahad Distance: 3 hr 6 min (154 km) via Bengaluru - Mumbai Highway/Mumbai - Pune Highway/Mumbai - Pune Expressway, Fastest route, the usual traffic, This route has tolls. Parvati(Parvati Devi) underwent austerities meditating on Ganesha (The supporter of the entire Universe) for twelve(12) years at Lenyadri (another Ashtavinayak temple, where Lord Ganesha is worshiped as the son of Parvati). Pleased by her penance, Ganesha blessed her by the boon that he would be born as her son. In due course, Ganesha was born to Parvati at Lenyadri and named as Gunesha by Lord Shiva. Little Ganesha once knocked an egg from a mango tree, from which emerged a peacock. Ganesha mounted the peacock and assumed the name Mayureshwara. The 'sindhu' was given the ever-full bowl of elixir of life (Amrita) as a boon from the Sun God. The demon was warned that he could drink from the bowl as long as it was intact. So to security the bowl, he swallowed it. Sindhu terrorized the three worlds, so the Gods asked Lord Ganesha for help. Lord Ganesha defeated Sindhu's army(Sena), cut his general Kamalasura into three pieces and then cut open Sindhu's body, emptying the amrita (elixir of life) bowl and thus killing the demon. The creator 'God Brahma' is described as having built the 'Morgaon' shrine, and marrying 'Siddhi' and 'Buddhi' to Ganesha. At the end of this incarnation, Lord Ganesha returned to his celestial abode, giving his peacock mount to his younger brother 'Skanda', with whom the peacock mount is generally associated. 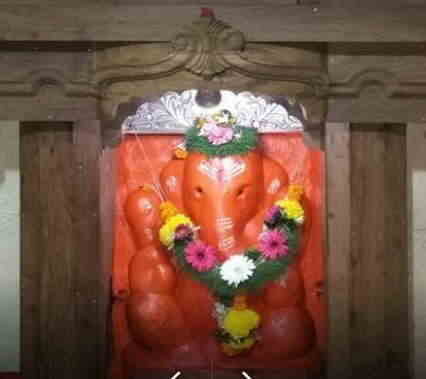 Varad Vinayak Ganpati or Mahad Ganpati Temple, also spelt as Varadavinayaka Mahad, is one of the Ashtavinayak temples of the Hindu deity Lord Ganesha. It is located in Mahad samll town situated in Khalapur taluka near Karjat and Khopoli of Raigad District, Maharastra, India.